The Premier League's latest push to improve player behaviour is nothing more than lip service, according to three-quarters of the grassroots football community. 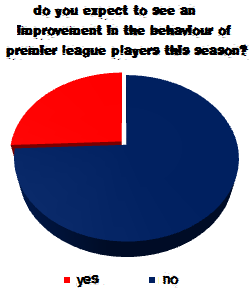 74% of Club Website members surveyed did not expect the latest reminder to players to Get on with the Game - the name of the Premier League's campaign - to lead to an improvement in behaviour. Originally launched in 2008 alongside the FA's Respect programme, the Premier League's campaign was put firmly back on the agenda for the 2011/12 season by Chief Executive Richard Scudamore. The top-flight supremo said he hoped the new push would help to tackle the "elements of unacceptable behaviour" towards officials in the Premier League, most notably "visibly disrespectful behaviour, mass confrontation and the like." The Premier League's message is typically positive, but Scudamore and his colleagues know that actions speak louder than words - and a 74% vote of no-confidence suggests that they still have a lot of convincing to do. The optimistic 26% who do expect to see an improvement in behaviour this season may at least find some encouragement in the opening two weekends' action, which have been relatively flashpoint-free. So far so good then for the Premier League and the Professional Game Match Officials board, who helped develop the latest guidelines. Two rounds of games down. 36 to go. But it's a long road until May and the pressure will rise. Big games will be played, big decisions made - some of them wrong - and there will inevitably be flashpoints. When that happens, will players remember to Get on with the Game? And if they don't, will the match officials punish them accordingly and keep things in order? Three out of four people suspect they won't. Let's wait and see shall we? Premier League players have been reminded to 'Get on with the Game' this season. Do you expect to see an improvement in behaviour?